Like the random, wispy look-- the non-sculpted look. 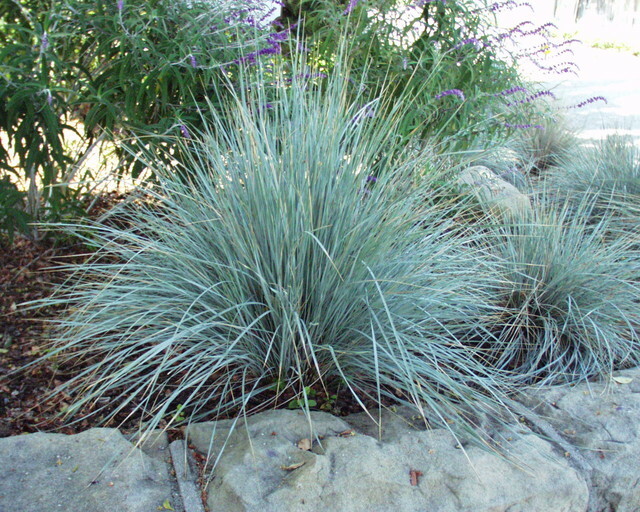 blue oat grass Botanical name: Helictotrichon sempervirens USDA zones: 4 to 8; hardy to less than 0 degrees Fahrenheit Water requirement: Occasional; drought tolerant Full sun to light shade Mature size: 2 feet tall and wide Drought tolerant; deer resistant; can handle air pollution Seasonal interest: Evergreen in temperate climates; flowers in summer Plant or divide in early spring A towering crown of bluish-brown flowers projects about a foot above the foliage in summer, aging to a golden oat color in fall. I like this plant in the foreground.